iFixit is a new service which aims to get everyone repairing their broken tech, instead of throwing it away, which is excellent. 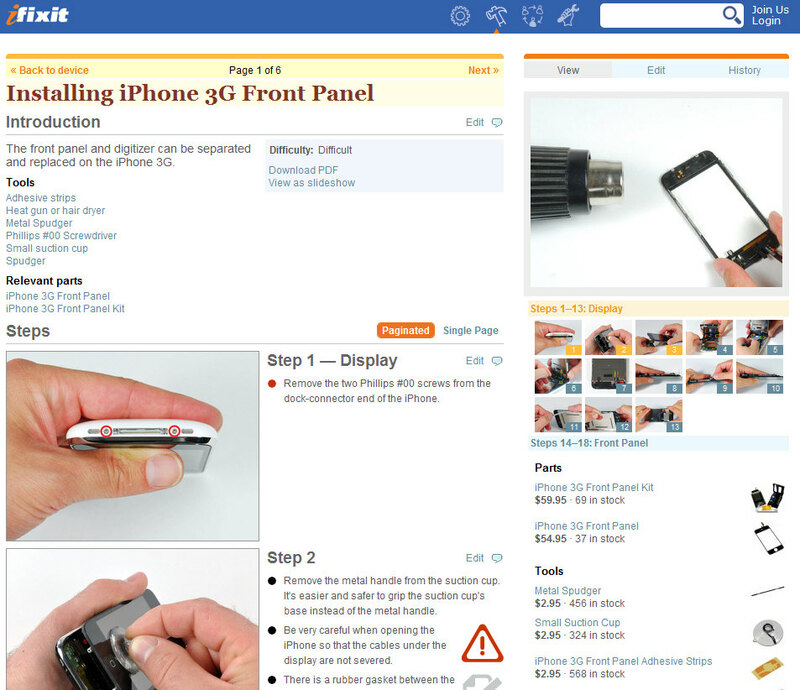 It’s basically a user editable wiki for consumer electronic repair manuals and the idea is that the community will come together and help each other repair their devices. The site also sells tools and parts to help get the job done which is hugely valuable. A few weeks ago I dug out an old Internet radio and found it wouldn’t work with my new N spec router, which meant it was useless. Instead of throwing it away I did some searching and discovered you could replace the WiFi dongle inside with a standard USB stick model and get it working again, which I did. It took me a few hours o fiddling around but boy did it feel good when I got it running again for the cost of a new cheapo WiFi dongle. All of which is a long way of saying I love this idea. We absolutely should start repairing our products again if we can, the amount of stuff we throw away which is only slightly broken is probably obscene, and the site’s rather emotive video (above) outlines the longer term issues that arise because of our current throwaway mentality. The site interface is clean and very accessible and the addition of helpful comments and extra large images for complex tasks is really valuable. Unfortunately as you’d expect with a new service, the content is rather sparse at the moment and focuses on Apple products a lot, which means it won’t help out 90% of people with a problem. But with some good marketing and patience I can see this becoming a must-visit location for tech lovers everywhere. Bookmark, contribute and use and we’ll definitely do some good for the planet. Fix the Planet Repair is recycling! The best way to keep electronics out of landfills is to keep them working longer. Toxic electronic waste is a global problem that we are working to solve. Self repair saves you money and helps the environment!